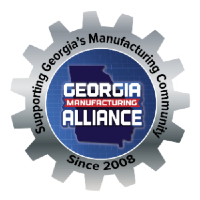 Leaders of the Georgia Manufacturing Alliance (GMA) proudly stand on the steps of the state Capitol as Governor Nathan Deal presents the third annual “Buy From Georgia” proclamation. steps of the state Capitol as Governor Nathan Deal presents the third annual “Buy From Georgia” proclamation. 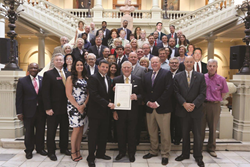 “Although I was not able to attend the proclamation ceremony at the Capitol this year due to a death in our family, I was proud to see the GMA team pull together and make the event a huge success. The industry leaders who are involved in GMA are the best of the best and understand the power of working together,” said Moss.